Like a Milan a fashion show, in typical Dainese fashion we have been shown a glimpse of what the industry leader will be offering in the Spring for 2013. The new glove line incorporates some changes to a few old favorites and some new faces. 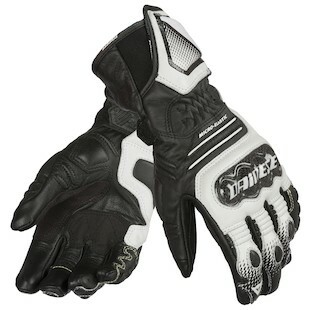 To kick it off, Dainese has updated the venerable Full Metal Pro Glove and renamed it the Dainese Full Metal RS Glove. 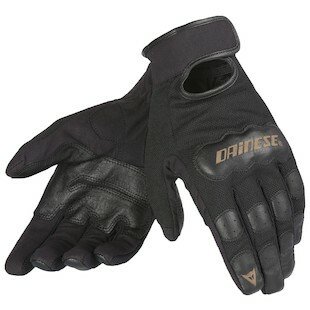 As with many of the new Dainese gloves, these gloves carry a CE certification. This is the first time we have seen this used on a glove and as of now details are limited. There are handful of upgrades including better protection for the head of the ulna bone (always one of my gripes with the Full Metal Pro), Pittard's® leather reinforcement between thumb and index on the left hand, and Digital Sheepskin reinforcement between thumb and index and fingertips of index and middle finger of right hand. It is nice to see an asymmetrical detail like the reinforcement in this glove since both hands perform slightly different tasks controlling the bike. These will be offered in host of colors to match your kit, including a hot new BMW Motorrad version. In the land of top notch racing gloves, this could be the new king. Next up on the catwalk is the Dainese Pro Metal RS Glove. These slot in just below the Steel Core Carbon Gloves and feature the same asymmetrical reinforcement treatment that the Full Metal RS Gloves have as well as the CE certification. They don’t have the hard protective plate on the back of the hand that the Full Metal or Steel Core have, but in it’s place there is a perforated and padded panel. Nice details like an additional leather tab to cover the wrist strap and bi-elasticated stretch panels in the fingers will make these a solid choice for the street. 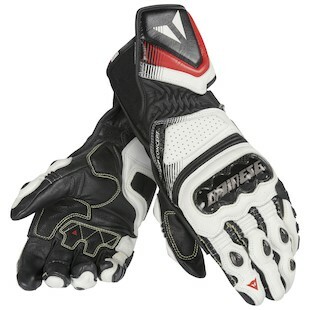 The Dainese Druids ST Gloves and Dainese Druids S-ST Gloves expand the Druids line. 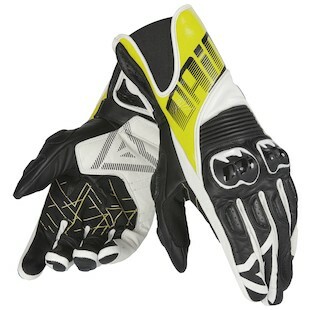 Continuing this years trend these gloves have the asymmetry found in the other top of the line Dainese gloves, albeit with slightly different materials. Amica Suede and Digital Suede replace the Pittard's® leather and Digital Sheepskin of the top tier gloves. A CE certification is also part of the package. The Druids ST Gloves have a subtle change in the cuff design for greater coverage and additional elastication in the thumb, index and middle fingers for increased comfort and control. 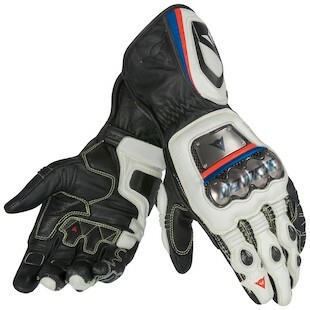 The additional S in the Dainese Druids S-ST Gloves stands for Short Cuff. This will be a short cuff version of this glove and it looks to have the same features as it’s full gauntlet relative. in a short cuff glove. The next collection that has had a make over is the Carbon Cover. The Dainese Woman’s Carbon Cover ST Gloves debut this year with a female specific fit and impressive protection features for a mid level glove. A redesigned Carbon knuckle and an improved cuff design are some of the highlights for this glove. Additional elastication in the index, middle and ring fingers should up the comfort ratio and TPU inserts on the little finger help to protect in an off. Curiously the Men’s/Unisex Dainese Carbon Cover ST Gloves add TPU inserts in the palm and Dainese’s patented Distortion Control while the woman’s glove does without. They will be available in colors to match most any ride including the Black/Orange/White option for KTM or Harley crew. Just like the Druids family, a short cuff Dainese Carbon Cover S-ST Glove will join the lineup and it is nice to see that a Dainese Women's Carbon Cover S-ST Glove will also be available. It is nice to see a few new options for women in the race/sport end of the spectrum. The Woman's Dainese Motodon EVO Gloves walk the line somewhere in between. The Black/ Black version looks pretty subdued and slightly techy with the carbon inserts on pinky and ring finger knuckles and retro with the perforated panels on the fingers. 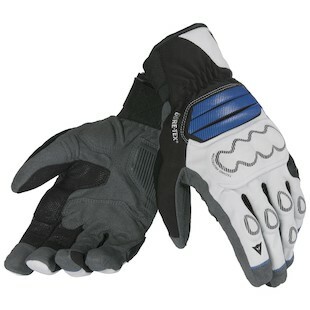 The Dainese Veleta X-Trafit Gore-Tex Gloves seem to fall in with the on/off road crowd. The short cuff design would be at home on a BMW R 1200 GS or Triumph Tiger 800XC. X-Trafit technology will provide optimum grip for excellent control, durable waterproofness for dry hands, and breathability for climate comfort. You guessed it, these are CE certified as well and have a silicon print on the left hand for steady grip on the clutch side and Digital Suede leather reinforcements on the throttle side. These make me want to buy an ADV bike and take a few months off of work. I am not quite sure where the Dainese Crono Gloves fit in on the runway, but I like them. Funky 80's style logo on the Black/Fluorescent Yellow colorway looks particularly good and the print on the palm reminds me of a Van Halen guitar. Polyurethane knuckles are there to protect and the palm is reinforced with Clarino leather. Switching gears, there is a new option that will look at home on a slammed bobber or a stripped down cafe racer. The Dainese Double Down Gloves are a lightweight option that should be comfortable in the hottest of the hot and while providing good grip on your Steel Horse. 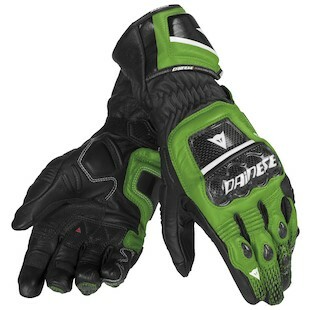 In addition to that Dainese is throwing down in the dirt with the new Dainese MX Gloves. Super breathable Tessuto mesh make these a desert riders dream and the silicon print on the palm helps keep things under control. The 2013 Collection looks strong, I cant wait to get my hands on them.